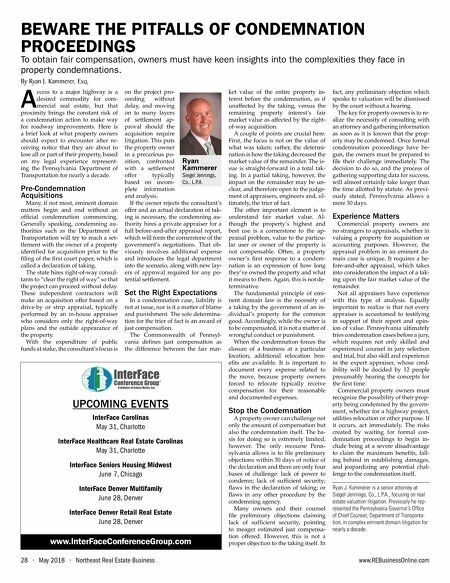 www.REBusinessOnline.com Northeast Real Estate Business • May 2018 • 29 FROM RADAR TO REDEVELOPMENT Redevelopment of New Jersey's Fort Monmouth will result in new residential space, 2 million square feet of office/research space and 350,000 square feet of retail. By David Cohen T he former Army fort where U.S. aircraft detection radar was birthed is in the midst of a large- scale revitalization that will see nearly 1,200-acres redeveloped with housing, 2 million square feet of office/research space and more than 350,000 square feet of retail. Shuttered in 2011 by the Base Re- alignment and Closure Commission, Fort Monmouth stretches for more than two square miles across Eaton- town, Oceanport and Tinton Falls, New Jersey. Redevelopment of the site has been under way since 2013. To date, 13 properties have been sold for a total of $29.4 million and an additional 17 properties, valued at $78.6 million are under contract. By the end of 2018, an estimated 1.16 million square feet will be activated, bringing in a total of 1,461 jobs. The project is the largest ever redevelopment of an Army base in New Jersey. "Ultimately, we're looking to have roughly 10,000 people working at the fort — that's about 10 years out," says Dave Nuse, executive director of Fort Monmouth Economic Revitalization Authority (FMERA), a group which was created to guide the investment, growth and integration of Fort Mon- mouth and the surrounding commu- nities. Live Building housing on the site was the first priority of FMERA and the first residential project is already partly completed. RPM Development Group pur- chased 117 former officer housing units in Oceanport and will convert them to a mix of for-sale and rental units. For- ty-eight of the units were completed in 2017 and are currently leased. Barker Circle in Oceanport, which entails the adaptive reuse of historic, three-story Army barracks buildings, will likely be redeveloped into 75 apartments or condos. Currently there are very few rental properties in the area and Nuse says he expects the on- site rentals to be in high demand. The rest of the residential offerings in the three towns will be a mix of mostly owner-occupied single-family detached homes and townhomes as well as small number of apartments. A total of 1,408 housing units are current- ly planned. Costs for owner-occupied housing will start in the mid-$400's. Work After housing, attracting office ten- ants is next on the list for FMERA and Nuse says that technology companies — particularly information and com- munications companies — are the top target, along with companies in the healthcare, advanced manufacturing, defense and higher education sectors. The fort has a storied history in tech and communication innovation. Fort Monmouth is the birthplace of modern radar systems. In 1938, the U.S. Army's first radio-based aircraft detection and ranging system, later called radar, was developed on post. The first radio- equipped meteorological balloon, a forerunner of modern weather sound- ing techniques, was also launched from the fort in 1928. And the area continues to support innovation. Currently there are 1,729 professional and scientific companies within a 20-minute drive of the fort. Commvault, a data and informa- tion management software compa- ny, is currently headquartered in a 275,000-square-foot facility located on the former base in Tinton Falls and has approvals to develop an additional 650,000 square feet on the 55-acre tract for an estimated 2,500 employees. "Attracting leading tech companies to the fort is a key component of our master plan," says FMERA Vice Chair- man Robert Lucky. "Commvault's initial decision to relocate to Fort Mon- mouth and stay in New Jersey has been an asset to our redevelopment efforts. We look forward to the next phase of Commvault's expansion." In addition to Commvault, the former Patterson Army Hospital in Oceanport was renovated and is now occupied by AcuteCare Health System. TetherView, an information- technology company, purchased and renovated Russel Hall in 2015. The building, located in Oceanport, now serves as the company's headquarters. Play One of the ways developers intend to lure people to live and work at the site, which is 55 miles south of New York City, is an attractive mix of ame- nities. In addition to an existing 71- slip marina and boat ramp launch on Oceanport Creek, the former fort is home to an 18-hole golf course cur- rently undergoing a $30 million reno- vation and a seven-acre fitness center complex, which was purchased by Fort Partners Group and is in the midst of a complete renovation. The Fort Monmouth Bowling Cen- ter, a 17,600-square-foot bowling alley at the corner of Saltzman and Wilson Avenues in Eatontown has been put up for sale in the hopes it can be re- developed and expanded into other entertainment uses. "We're looking to find someone to expand the bowling alley and make it something that would attract people to the fort," says Nuse. "Ideally we want to attract millennials and tech work- ers. We're looking to bring entertain- ment and retail amenities to the fort to really make it a vibrant work-play community." The site will also feature a sizeable amount of open space. Bike trails and bus service around the fort are planned in an effort to make residents and workers non-dependent on cars. The Little Silver railway station is also within walking distance of the fort. Lifestyle-focused Retail Within a 20-minute drive of the fort, there are around 330,000 residents, and 40 percent of the households have incomes of more than $100,000. To serve these residents and the ones that will move into homes planned as part of the fort redevelopment, an es- timated 350,000 square feet of retail is planned at the former fort, to be spread across the three towns of Tinton Falls, Eatontown and Oceanport. "We want retail that will be walk- able and that will create town centers in each of the towns that make up the fort," says Nuse. In Tinton Falls, 50,000 to 70,000 square feet of retail is planned and will be part of the Tinton Falls town center. The Oceanport town center will in- clude 70,000 square feet of retail and in Eatontown, the town center will have around 150,000 square feet of retail. The remaining retail will be spread across the fort in locations such as the bowling center and a World War II-era dance hall in Oceanport. In late February, plans for a $130 million mixed-use lifestyle and enter- tainment destination in Eatontown fell through after developer Paramount Realty Services and FMERA failed to come to terms. FMERA has now en- tered into negotiations with a new developer for the town center project. Nuse says the goal is to bring a con- tract to the board this summer with an expected completion date of early 2020. "We're looking to have something unique here — something different," says Nuse. "Our board made it very clear that they weren't looking for us to go after big box retail. 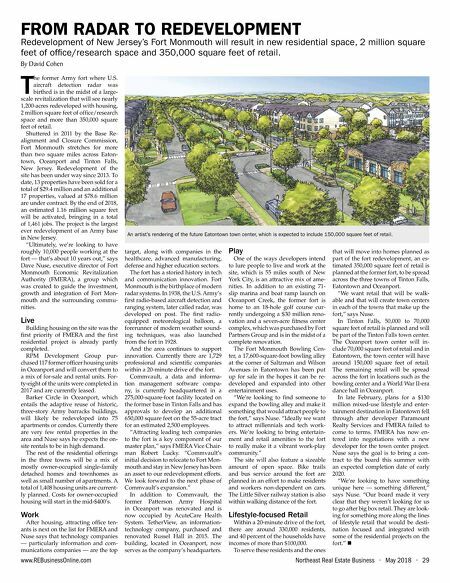 They are look- ing for something more along the lines of lifestyle retail that would be desti- nation focused and integrated with some of the residential projects on the fort." n An artist's rendering of the future Eatontown town center, which is expected to include 150,000 square feet of retail.